As I mentioned in my previous post, we've been doing our spring cleaning a little late and have been doing a bit of summer cleaning around here. It's been very cleansing in a physical and spiritual way and I have to admit I've enjoyed it quite a bit. The energy is definitely changing because we are getting rid of things that we no longer need and it's freeing. We're donating whatever we can. Another side of this little project of ours is the finding of things that we've forgotten. It's truly like opening a time capsule to my first years of living here in England, which began in March 2006. Rediscovering these various pieces of my recent past has most certainly put me in a reflective mood. Last weekend when I went through some things that were in storage, I came across this beautifully quirky pink hand thing shown in the photo above. It's funny...I don't remember when I got every single thing, but I remember this hand vividly. I bought it in 2006 for about £5 (roughly $8). 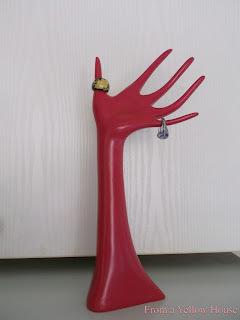 It's supposed to be used as a place to hang jewelry, but I remember just thinking it was so weird-looking and I had to have it. I love me some weird. Lol! It got put in storage with the intention of making a special place for it, but the days and years flew by and it got lost in the shuffle. Well now that I've found it again, I'm gonna have to find a place for it. It's not my customary blue, but the deep pink works for me too. They didn't have a blue one ;-) In case this is your first time visiting, you can read about my love for the color blue here if you'd like. Yes, it's a good idea to get things in order before winter sets in, you're so right. I love how things feel different now that we're clearing the clutter. It really does give you a new perspective. I'm so glad that you like my pink hand. Lol. Isn't it fun? :) It's so great to find another person who loves blue...Yay! Thanks so much for commenting.